It took 18 years for XTC to reap profit from its record deal with Virgin. This time around, Andy Partridge wants a ticket out of Swindon. The final straw for XTC's Andy Partridge came in 1992. Nonsuch, a lush and ambitious XTC album that also offered a few possible hit singles (‘The Disappointed’, ‘Dear Madam Barnum’) had, in Partridge's mind, been left on the starting block to wither by record label Virgin just weeks after its release. It was the last insult to one of the truly influential singers and songwriters of the past 15 years was prepared to wear. Says Partridge: "I told Virgin, ‘unless you make our deal better or release us, we're not going to make any more music for you’. They wouldn't do either, so I said: ‘OK brothers, down tools’. We've spent the past four years on strike. "I was very upset that we spent 18 years on the label before we went into profit. We had such an appalling deal. They made, on conservative estimate, about 30 million pounds out of us and we're still stuck in Swindon". A few weeks before this interview Partridge and band members Colin Moulding and Dave Gregory were finally freed from Virgin Records to pursue other record deals. "We've got about 10 offers, some very good profit-sharing deals," says Partridge. "Strangely enough, the worst thing we've been offered is from the new Virgin label V2. They offered a crappy old rock 'n' roll rip-off deal -- sign on the back of the cigarette packet -- despite all the nonsense they were saying about making other companies jealous". Partridge is on the line ostensibly to talk about Fossil Fuel, XTC's final release for Virgin. 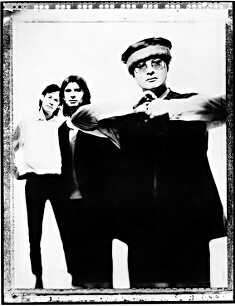 Unlike previous compilations, (Waxworks, The Compact XTC), Fossil Fuel includes every single the band has released since 1977, encompassing earlier, spikier pop songs such as ‘Science Friction’, ‘Are you receiving me?’ through to hits like ‘Generals and Majors’, ‘Senses Working Overtime’ and ‘Dear God’ and later material such as ‘The Ballad of Peter Pumpkinhead’ and ‘The Disappointed’. It provides a clear picture of XTC's evolution from naïve teenagers to master writers and arrangers and also of Partridge's growth into one of pop's most distinctive vocalists. "On the earlier records it was me panicking at being in the limelight and grasping for a style that ended up a cross between Buddy Holly and a wounded seal," he laughs. "After the first three albums i started to relax a little." Over the past two years Partridge has experienced three months of deafness (middle-ear infection), the end of his marriage and career heartache. Yet his cheer of the phone douses notions that he's depressed. "I've been turned upside-down totally, but, hey, it's good. The hammer comes down on the metal and it makes good, sharp songs." Around 40 or so of them, according to Partridge, who is just itching to see how they sound recorded. With XTC's almost legendary reputation for run-ins with producers, one wonders how the band will tip-toe through the minefield this time around. "I'm not difficult," Partridge argues. "Just particular. I just want the baby to be born correctly; I wanted help from producers, not hinderance. "We have been near to perfect producers. Ironically, probably the most perfect producer was Todd Rundgren, but he is the one I got on with the least. Unfortunately he's from Uranus or something and he doesn't know how to get on with other human beings." Partridge lives in Swindon, west of London, where he grew up. And it is not, he wants to make clear, by choice. "I must have done something really terrible in a past life because i find myself still stuck here," he says. "It's not so much how many miles west, as how many light years culturally and mentally it is from London. I'm stuck in a rather nice little house... I've not yet managed to get my ship out of the terrible black hole that is Swindon." Fossil Fuel is out now on Virgin.